The HTC Titan II has already gone through the Fly or Die ringer, but the real determining factor for these phones is the level of competition surrounding them. 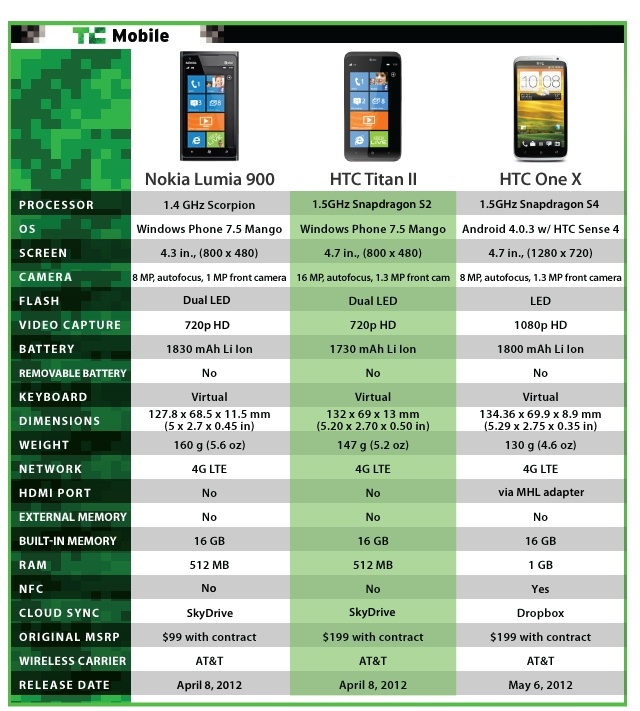 In the case of the Titan II, the HTC/Microsoft partnership is most threatened by more HTC and Windows-powered phones, namely the Lumia 900 and the HTC One X. So what do these phones have that the Titan lacks? How does the Titan wipe up the floor with them? Well, that’s why I’m here, and why we’ve made this lovely graphic for you. Truth be told, specs really don’t matter anymore, especially specs like processor clock speed and (I’m sorry to say it) megapixel count on cameras. What really matters is your preferred operating system, display size/resolution, and comfort with design. When weighing these three phones against each other, the similarities are abundant, as are the subtle differences. For example, the Lumia 900 will net you $100 less than either of the other two phones. At the same time, it’s a touch smaller than the Titan and the One X, and if you prefer HTC hardware to Nokia’s then that doesn’t really matter. I happen to be a pretty huge fan of the Lumia 900 simply because Windows Phone can pull off its stupid 480×800 resolution requirement on a 4.3-inch screen much better than it can on the Titan’s 4.7-inch display. Past that, the phones are quite similar. The Lumia feels a bit more premium in the hand, yet HTC does an excellent job of making even their plastic phones feel high-end. If Windows Phone is your flavor, this is definitely a tough call. Good luck. If it’s HTC that tickles your fancy, it all comes down to the OS. Do you prefer Sense 4 on top of Android 4.0 Ice Cream Sandwich, or would you prefer to play with Microsoft. The One X specs slap down the Titan II like Daniel LaRusso at the beginning of The Karate Kid, but as I mentioned earlier, specs matter less and less these days. Where you’ll really win with the One X is the 4.7-inch 720p display. If you can tote it around comfortably, it really doesn’t get much better than that. The ball is in your court, my dear readers. Choose wisely.